Last week we joined together to begin exploring Mountain Lion’s System Preferences. This is a journey that will absorb our interest for several weeks to come. But it’s also one that requires us to venture out of System Preferences in order to illustrate what a particular feature does and why you might find it useful. Today’s discussion of Mission Control is exactly that kind of lesson. …there were features called Exposé (introduced with Mac OS X 10.3) and Spaces (included with Mac OS X 10.5). They were created to help you unclutter your desktop. While useful for anyone who used a Mac, these features particularly benefited those sitting in front of a small-screen laptop, where desktop real estate is limited. Exposé was designed so that you could temporarily clear away the junk on your Mac’s desktop and focus on a particular interface element. Specifically, you could reduce all open windows to tiny representations of those windows, move your pointer to the one you wanted to activate, and click on it to bring it to the fore in its full size. Or you could view just a particular application's open windows in their diminished size and select the one you wanted to work with. Or you could choose to temporarily banish all open windows from the screen in order to interact with a file on the desktop. Spaces was a feature that allowed you to create multiple virtual desktops that acted as individual workspaces. The idea was that you’d organize each workspace by the kind of work you were doing. So, you'd put the applications you needed for organizing your life in one place (Mail, Address Book and iCal, for example). In another space, you'd open iPhoto and Photoshop Elements to work with your images. And in yet another, you'd open a word processor or spreadsheet application to get “serious” work done. To switch tasks, you’d simply move to a different workspace. 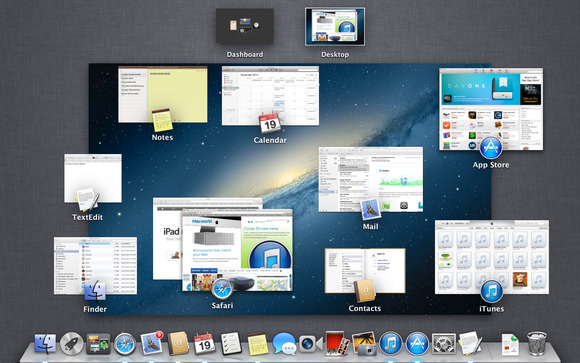 With Mac OS X Lion, Apple combined these two features into one and named it Mission Control. Longtime Mac users may grumpily hint that not every feature found in Exposé and Spaces made it into Mission Control. And they’re right. But for our purposes, that's water under the bridge. My job is to explain how these Mission Control features now work. The easiest way to get a grip on Mission Control’s Exposé-like features is to click the Mission Control icon in the Dock, or to press either the F3 key (or Control and the up arrow key) on your Mac’s keyboard. Suddenly, you're viewing your Mac’s desktop in a smaller view, with two even smaller windows above—one titled Dashboard and the other, Desktop. (If you have a Mac with a trackpad, you can get to this same view by swiping up on the trackpad with three fingers.) To leave this view, just click the larger of the three windows (or swipe down with three fingers on a trackpad). What you see once you do this depends on the applications and windows you have open. If you have no applications open—as would be the case if you've just started your Mac—you’ll see nothing in the larger window but the Finder’s desktop pattern and then the Dashboard and Desktop windows above. Open a single application and then open a window within that application, and you’ll see that window along with an icon representing the application. Open another application (and a window within that application) and you’ll spy each application’s windows and accompanying icons. If you have multiple windows open in a single application, those windows will, by default, be grouped together in a kind of stack. For example, open Safari and Calendar and engage Mission Control, and Safari’s windows will appear in one area and Calendar’s windows in another. To navigate to one of the open windows, just move your pointer over it and click. Mission Control will disappear, and the window you selected will become active. Other than this being a cool effect, it provides an easy way to navigate to exactly the window you wish to work with. This is akin to Exposé’s All Windows view. And what about those other Exposé options? Leave Mission Control and move to an application where you have a few windows open—TextEdit, for example. Press Control-Down Arrow, and you’ll view each open window within that application as a smaller window. Any visible windows from other applications will be hidden. To make a particular window active, just click on it. This is the Application view. But, as I mentioned, Mission Control is about more than Exposé. Let’s now look at the Spaces features. Mission Control as you first see it with the Dashboard and Desktop spaces. That’s Mission Control’s Spaces feature at its most basic. Now let’s go beyond the basics. In the Desktop space, open a new Finder window by pressing Command-N. Engage Mission Control and move your pointer to the top-right corner of your Mac’s display. When you do this, a box appears that includes a plus (+) button. (Alternatively, you can hold down the Option key while in Mission Control to make the box appear.) Clicking on this box creates a new space. It will be called Desktop 2. Click on that space to make it active. Notice that the new window you created is absent. That's because you’re now in a new space, free of the windows that remain in the original Desktop space. Using one of the techniques I just described, move back to the original Desktop space (use Control-Left Arrow or swipe three fingers to the left rather than to the right). 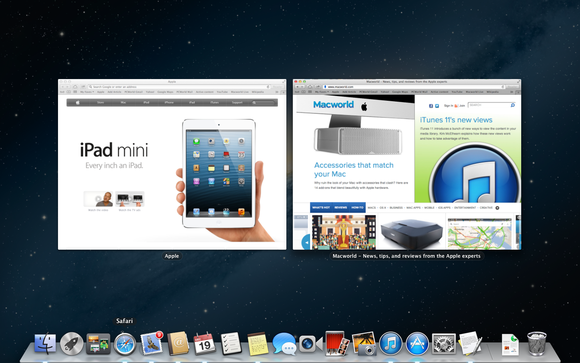 There’s the Desktop space along with its open Finder window. Now move back to the Desktop 2 space and open two Finder windows. Invoke Mission Control, hover your pointer over the Desktop 2 space, and click the small X that appears in the top-left corner of the small window. The Desktop 2 space disappears. Click on the Desktop space and notice that the Finder windows you created in Desktop 2 now appear in the original Desktop space. Why? Because OS X would be very sad if, when you closed a space, you lost the work in it. Instead, that work will shift to the original Desktop space. Here’s another trick: Launch Calendar and, in the top-right corner of the Calendar window, click on the icon that looks like two diagonally pointing arrows. This enlarges the window to full-screen view. Within this view, the window takes up the entire screen and hides the menu bar. If you want to see the menu bar, just drag your pointer to the top of the screen and it will appear. Invoke Mission Control and you’ll discover that Calendar is now its own space. And it is because any time you push an application into full-screen view, it becomes a space. If you change it back to window view by clicking on the two-arrow icon, the space disappears. One more trick: You can move windows between spaces. To do that, just click and hold on a window’s title bar (the top, gray portion of the window) and drag it so that it goes off to the left or right side of the screen (dragging to the right works only if you have a space open there). Wait a second, and the space to that side appears. Just finish dragging the window into it.